Inside the generator, the concrete foaming agent is diluted with water to make a pre-foaming solution which is then forced at high pressure through the foaming lance. This produces a uniform, stable foam which has a volume of about 20 to 25 times that of the pre-foaming solution. It can be placed easily, by pumping if necessary and does not require compaction or levelling. It has excellent water and frost resistance and provides a high level of both sound and thermal insulation. The foamed concrete formed is very stable and lightweight, and will not sink into soft ground or impose undue loading on roofs and other structures. It is very versatile and since it has a huge range of dry densities and strengths, it can be tailored for optimum performance and minimum cost by choice of a suitable mix design. 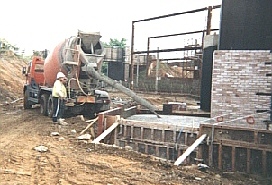 Different mix designs have different quantities of sand, cement, water and foam. 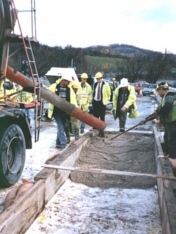 Optimisation can be further refined by using different types of cement, sand or other ingredients such as fly ash. EAB Associates are pleased to offer detailed advice to EABASSOC Foaming Agent users, including suggestions for mix designs for various applications and teaching customers how to calculate foam quantities for the mix designs. 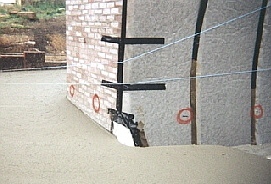 We can give practical advice about making and placing foamed concrete. We are also available for conducting trials, site work supervision and full scale contracting work. For more information see the Frequently Asked Questions section.